n. orig. U.S. (usually in pl.) a pair of quotation marks gestured by a speaker's fingers in the air, esp. to indicate that what is being said is ironic, mocking, or disingenuous, or is not a turn of phrase the speaker would typically employ. 1989 Spy Mar. 94/1 When Bob and Betty describe themselves in these ways, they raise the middle and forefingers of both hands, momentarily forming twitching bunny ears—air quotes, the quintessential contemporary gesture that says We're not serious. Interestingly, the two 1989 examples feel the need to explain the gesture, whereas the 1987 example just uses it. n. quotation marks used to foreground a particular word or phrase, esp. with the intention of disassociating the user from the expression or from some implied connotation it carries. 1956 Mind 65 3 The ‘scare-quotes’ are mine; Aristotle is not overtly discussing the expression ‘whichever happens’. 1960 P. T. Geach in M. Brand Nature of Human Action (1970) 119 Someone..might use ‘happy’, in scare-quotes so to say, to mean ‘what most people count happy, that is rich’. 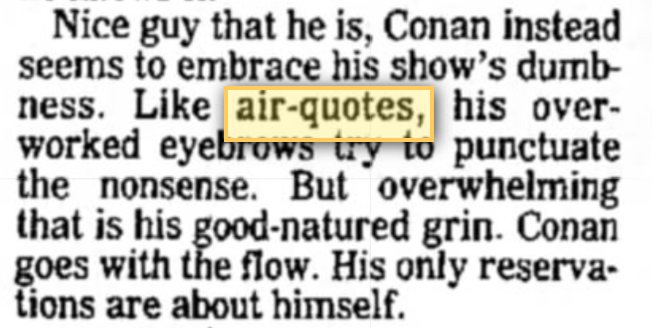 The term "air quote(s)" itself, and the strong "ironic, mocking, or disingenuous" connotation, seems to have arisen in the mid to late 1980s. The fact that "air quotes" rhymes with "scare quotes" may have played a role in this transition. But there are some problems. First, the container for the bomb would probably not survive the blast, making it hard to capture that energy. Second, even if the container did survive, it’d be incredibly irradiated. Third, if the container were imperfect, you might send a massive cloud of radioactive dust into the atmosphere. * Fourth, the Russian Embassy is calling, and they sound a little irritated on the phone. Note that in this case the use of air quotes is not "to indicate that what is being said is ironic, mocking, or disingenuous, or is not a turn of phrase the speaker would typically employ", but rather to signal a type of stress and accent on the word "all", part of a larger prosodic pattern indicating that not takes scope over all (so that it's not the case the this power-generation method violates all of our treaties), while all is contrastive (implying that the method does violate some of our treaties). For discussion, see Mark Liberman and Ivan Sag, "Prosodic Form and Discourse Function", 1974. IIRC the first time I saw air quotes (the gesture, not the term) was as an undergraduate (1964-68), from a British guest speaker, in a non-ironic context. I had believed that Lewis Carroll referred to the practice of making quotation marks in the air in Sylvie and Bruno; but on checking, I find that in that case it was not quotation marks but a parenthesis. That particular practice doesn't seem to have been taken up. I take it that air quotes have the same ambiguity as printed quotes, which can be used either for actual quotation or as a distancing device, presumably because in the latter case there is an implication of 'as one might say'. It isn't always easy to distinguish the two uses; it's sometimes been proposed to use double quotes for actual quotation and single quotes for scare quotes, but people who try to do this keep coming up against cases where its not clear which they should use. For those of us old enough to remember "charades" as a popular party game, the air-quote gesture was used to indicate that the item to be solved was a quotation. Wikipedia dates "acting charades" to before "the time of the First World War." From this description, she probably wasn't using smart quotes. It seems most ironic uses of it now are with fingers bent–merely a product of electronic desktop publishing? I haven't been able to find this article, but I assume it's from 1993 when Conan O'Brien and Chevy Chase both debuted new talk shows. Yes, Justin is correct: that 1987 date is much too early; Conan O'Brien wasn't even hired by Saturday Night Live until 1998, so he could not have had his own television show that long ago. That would solve the "anomaly" of the lack of necessity to explain the term "air quotes." On the point of the article, my 8th-grade science teacher was famous (among us kids) for making "bunny-ear quote marks," but she did it unironically. That was in 1968-1969. I was under the (naive and scientifically unsupported) assumption that the expression "air-quotes" was formed on the analogy of the expression "air-guitar". But my position as an observer of such trends is not so reliable. Semantically, I was under the perhaps mistaken assumption that air-quoting was the droll speaking equivalent of the use of what are usually called "scare- quotes" in written discourse, and that this practice predated the use of the expression "air-quotes". Stephen Fry and Hugh Laurie always used air quotes in "A Bit of Fry and Laurie" when mentioning the name of their show. In one sketch, Fry kills Laurie, and immediately seguing into an tribute segment commemorating the life of Laurie, refers to Laurie, with air quotes, as Hugh "Excellent Sermon Vicar" Laurie. At the end of the sketch, Laurie reappears dressed in a white suit, (referencing the ghost character Marty Hopkirk in 70s show "Randall and Hopkirk (Deceased)") and Fry then calls the show "A Bit of Fry and Laurie (Deceased)", with both air quotes and air parentheses. https://www.youtube.com/watch?v=lccMNQxCmOc although this doesn't include the "(Deceased)" bit which I can't find on YouTube. Series 2 Episode 6, which aired April 1990. 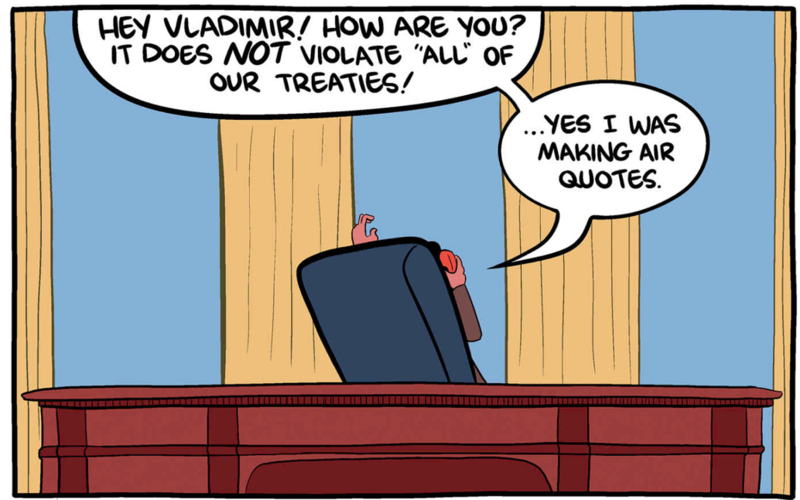 Rather than emphasis, I read the cartoon "all" as a straight quotation of the word "all", after the other party had said "this violates all of our treaties." Another non-ironic British usage of air quotes with context from 0:50-0:58 https://www.youtube.com/watch?v=mlgRrbVh4PI to define "catchy." Usually taken out of context but amusing none the less. "Catchy"
When my daughter was 5 she was fluent in English and French (and Spanish), at the level of a 5-year old, but her French was the one she knew best, because that's what she used with her friends at school. When she was talking to me in English she sometimes needed a word she knew in French but not in English, and she would insert a French word in an English sentence. When she did that it was perfectly obvious that she realized that it wasn't an English word, because you could "hear" the quotation marks in the form of very short pauses before and after the inserted word.